Do you know what ice cream and compressors have in common? Both are better when you have a choice of flavors. FabFilter’s new Pro C-2 is a veritable ice cream store of compression, offering eight different types, and just about every kind of parameter control you’ve ever seen in a compressor, and some you probably haven’t. 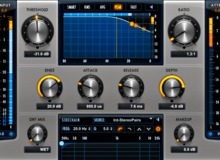 Universal Audio just released a new version of its software for Apollo and other UAD-2 devices. The release is highlighted by three new plug-ins, including spot-on emulations of the Neve 88RS Channel Strip Collection, the Tube Tech CL-1B Compressor, and the Marshall Plexi Super Lead 1959.